The Chamorro Cultural Fest Committee of San Diego, California, hosted its 3rd Annual Chamorro Cultural Fest at the Market Creek Plaza, bringing together thousands of attendees to share in food, culture, games, and fun. This day long event which took place on March 24, 2012, seemed to be more than a fiesta, it was an amalgamation of talents which resulted in a synergistic energy, making the event that much more exciting and fun filled – an event that only comes once a year. The fact that it was free was more than a reason to celebrate. It was a success, all in all. 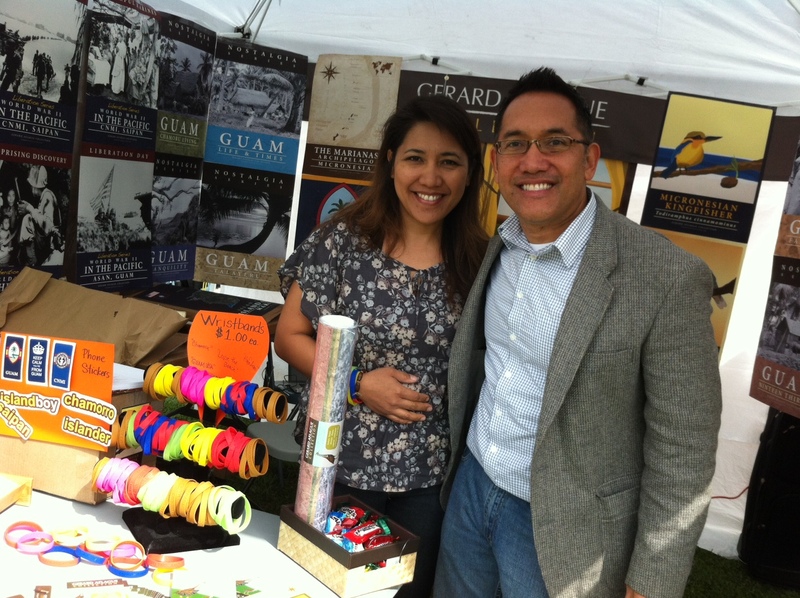 With the motto of “Celebrating the People of the Mariana Islands”, there sure were many opportunities to do so. With dancers, singers, wood carvers, artists, and chefs, among others, one could surmise that there in fact was a celebration of talents from the Mariana Islands. With a half dozen workshops to provide the audience with interesting and educational opportunities to learn the culture and arts, it was hardly a boring experience. The line up at the workshops included learning the art of batik making with Judy Flores from the Guam Batik Gallery; story-telling with Tanya Taimanglo and Alison Cuasay from Guam Books and Beads; learning about the Sakman from Mario Borja from Tungo’ Ramentan Chamorro; learning dance and culture from Heidi Quenga from Kutturan Chamoru Foundation, and from Vince Reyes from Inet’non Gefpa’go; and learning the art of Raffia Braiding and Korona making from Ju’ne Sablan Hawkins. While the lines to the food vendors were long and drawn out, the taste of the islands could not dissuade anyone from leaving their place in the queu. The festival ended at sun down, while the event in the evening at the Jacobs Center just started revving up. With the DUB band, Ben “Maga Lahi” Lizama, Malafunkshun, and many other performers in attendance, hundreds of concert goers were lined up outside in anticipation of the doors opening at eight in the evening. We had a wonderful time in San Diego, without a doubt. It is our hope to be able to do this again next year, God willing. With our company opening up shop online a little less than a month ago, and having no prior vendor experience at a fair, we were absolutely encouraged by the many visitors and customers who came by to take in the many interesting illustrations. It is an honor to design tasteful and unique illustrated art for the many folks that were seeking our artwork, knowing that it will be displayed in the homes and offices of many across California and Las Vegas from where most people came from. While we brought over 40 unique illustrations to display and sell, we were unfortunately unable to bring three of our more recent designs including Two Lover’s Point, Bear Rock, and the Plumeria. However, these are available online now. 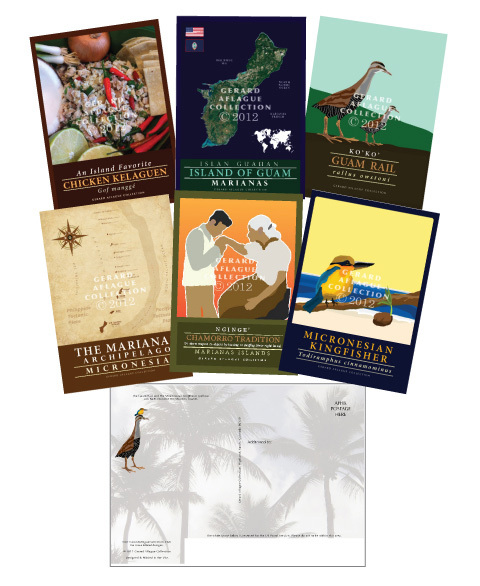 We stand committed to designing colorful and interestingly unique illustrated art that represents the Pacific Islands of Micronesia, including the Federated States of Micronesia, Palau, and the Marianas Islands, including Saipan, Rota, and Tinian. We believe that there is a market for those wanting a unique type of culturally-themed island art as a conversation piece to be displayed in homes and offices that is tasteful. If you know of a Chamorro cultural event that is coming up in the islands or in the mainland, feel free to leave us a message and let us now about it. Plumeria is a tropical flower related to the Oleander, and both possess a sap may irritate eyes and skin. While Plumeria take many forms and colors, the more common are the white Plumeria with the yellow center, and the more interesting flowers that have come on the scene are the deep pink tones. Jar of oil such i.e. Vaseline, Lei needle, 4-8 pound fishing line, 30-50 Plumeria flowers, galloon zip type plastic bag, and measuring tape. 1. Measure the length of the lie you would like by roping the fishing line around your neck to measure an adequate amount. 2. Thread the fishing line through the lei needle. Create a knot at the end of the line where the two join open ended. Create several knots if needed to ensure that the flowers are caught at the end. Ensure that the knot is bigger than the average diameter of the flower opening. 3. Keep flowers that are harvested from the tree in a zipped plastic bag and place in the refrigerator until ready to use. 4. Use oil based grease to lubricate needle. Needle flowers one side up, with all in the same direction. 5. Use your desired pattern of colors. Example: 5 yellow, and 2 pink Plumeria. 6. Upon stringing all your flowers through the needle, create a loop with both ends of the line and tie off well with several knots. 7. Place completed leis in zipped plastic bags and place in refrigerator until ready to use. Gerard Aflague Collection is now making available an assortment of full-color, vinyl stickers that are repositional, and colorful with an island theme. Over 25 different designs will be added to our product line that will depict regional locals abbreviated in 2 letters, Guam and CNMI seals, and various words that represent several regions in the Pacific. The two letter decals are great to affix to car vehicles letting others know where your origins are from, while the Guam and CNMI seals are sized to fit nicely on the back panel of an I-Phone, I-pad, or other clean flat surface showing your island pride. As for the various words such as “Chamorro” and “Pacific Islander” to name a few, they work well on car windows, phones, i-pads, or on bumpers. Your imagination is endless on the number of ways you can use these stickers. Limited designs are available in inventory. Pre-orders are being taken now at our website, and products will be shipped March 26, 2012. Wouldn’t it be wonderful if your family or friends received a unique colorful illustrated art piece from our website? Gerard Aflague Collection now has a convenient way for you to send a personalized gift certificate to your family or friends via email in amounts between $1 – $1,000 to be redeemed on our site for any of the products we offer. Give them a gift certificate for their birthday, anniversary, or a holiday. 1. You send them a gift certificate through our website. 2. They receive an email advising them of a gift certificate in an amount of your choice. 3. They browse our products and select what they want to buy. 4. At checkout, they use the gift certificate redemption number, and the amount is deducted from their total. 5. We send them the products that they ordered. Leave the worry to us. We will make sure they get what they want, and we will ensure that it is delivered promptly to their home or office. Did you know that we even send them periodic emails advising them that their package has been packed, or is now being shipped and on its way? It’s a simple process. We encourage you to play with our online gift certificate form and just see how quickly it works. Click here to demo how your gift certificate would look if you were to send one to your family or friends. We hope you take advantage of our gift certificate program on our website. Our gift certificate will not expire. This is a sample of what they would see when they receive an email from you. Probably the most notable landmark on the Island of Guam is Two Lover’s Point, or Puntan Dos Amantes as they call it in Guam’s native tongue “Chamoru.” It is a beautiful cliff on the westward side of the island jetting hundreds of feet up out of the Philippine Sea among the dolphins and thousands of other marine life found along this shore. The name Two Lover’s Point was coined after a popular local legend. Long ago, during a time in Guam’s history when Spain ruled the island, there lived a family of aristocracy in the capital village of Hagatna. The father of this family was a rich Spanish man, while the mother came from a family of a great Chamoru chief. They owned much land in the island and were well respected. Their daughter was full of beauty, and admired by many in the local villages. Her hair flowed with grace and had a healthy glow to it. She brought her parents much pride and joy because of what she had become. Her father was greatly wanting to have her daughter joined with a Spanish Captain in marriage. Upon knowing of his plans, she was upset and fled from Hagatna. She went in a northern direction meandering the tropical shores, until she found a peacefully quiet place. While pondering her situation, the day quickly became night, and the moonlight shone upon the ocean, showing a glimmering sight. At that time, while sitting on the sandy shore, she met a handsome and rugged young Chamoru warrior from a local family. He had a gentle demeanor, with bright eyes, long flowing hair, and a healthy physique. They instantly fell in love. When her father later learned of their meeting, he called for her to marry the Spanish Captain immediately. In hearing of this, she scurried away to the high-point above the shore where she met her native lover. At this point, her father summoned Spanish soldiers to pursue the lovers. In this pursuit, they found themselves trapped at the edge of the cliff, with no where to go. The young native warrior told them to stay back, while the father told them to remain. The lovers immediately took their long hair, and tied it into a large knot. They searched momentarily into each other’s eyes, and kissed one last time. Afterward, they leaped effortlessly off the high and steep cliff into the roaring blue waters below. Hundreds of feet in the air, they embraced with a love that never could be separated. Her father rushed after them to the edge and stared in disbelief as his daughter was no longer to be found. Two Lover’s Point above Tumon Bay, remains in its place, weathered by the sun, wind, and water, coined from this legend that continues to be the symbol of true love, between the souls of a two beings that found a love ever so pure, that no one could take it away. This legend and the Guam landmark is embodied in the latest colorful illustration designed as part of the Gerard Aflague Collection. Click here to order your very own illustration of this well-known Guam landmark today. Gerard Aflague Collection is accepting pre-orders on a pre-selected set of six illustrated postcards. Pre-Orders Available Online – Shipping Begins March 26, 2012. While we know that sending emails to family and friends can sometimes seem impersonal, we felt it appropriate to make a few of our illustrated designs available on postcards as an option to communicate with your family and friends. You can select one, or multiple copies of one, or order a set of six images. These postcards make a wonderful gift set, or provide for a unqiue way to say hello to family and friends from afar. Each postcard contains not only a beautifully illustrated image, but the back side of the postcard also sports a tropical coconut tree theme with a colorful Guam Rail and Micronesian Fisher to add to its character. Each postcard is 4.25 inches wide x 6 inches tall, and comes with a glossy coating on the front panel, with a matte finish on the back panel (writing side). Postage rates for postcards of this size are .32 cents for first-class mail. Browse our website online to see all the postcards offered for pre-order sale. Bear Rock, a natural land form found at Agfayan Point in Inarajan village on Guam is depicted in the most recent colorful illustration published for the Gerard Aflague Collection online. Residents and visitors alike who have ventured across the island can’t help but catch a glimpse of Bear Rock against the backdrop of the southern skies as they make there way through Route 4 meandering through the sleepy village of Inarajan, between Talafofo and Merizo village. Off the coast of the Pacific Ocean, Bear Rock is probably the most obvious animal-like rock formation on Guam, aside from Camel Rock. This rock formation jets out from a rocky outcrop over 50 feet in the air. Probably formed through the weathering and erosion process that occurs in the natural geologic process of time. Its anyone’s guess as to how long this rock will keep its bearish characteristics. 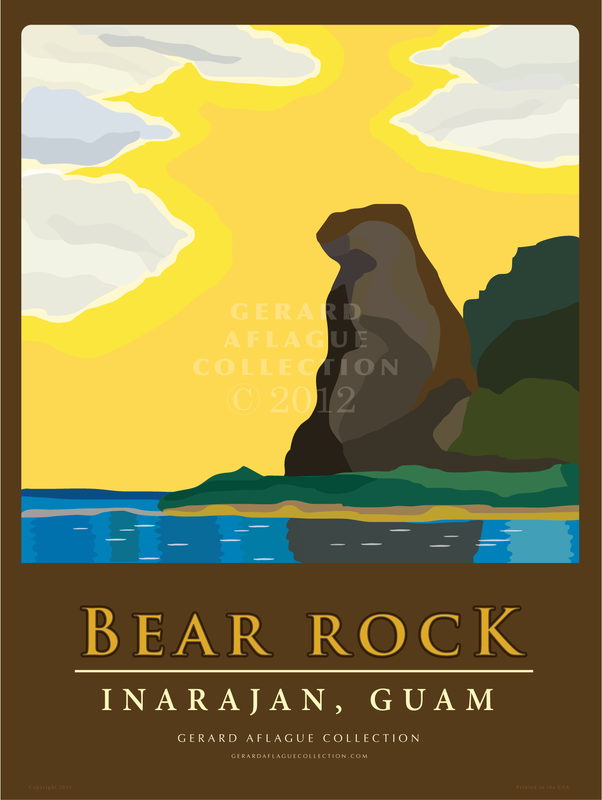 Click here to see and purchase this illustration of the Bear Rock in the Gerard Aflague Collection. 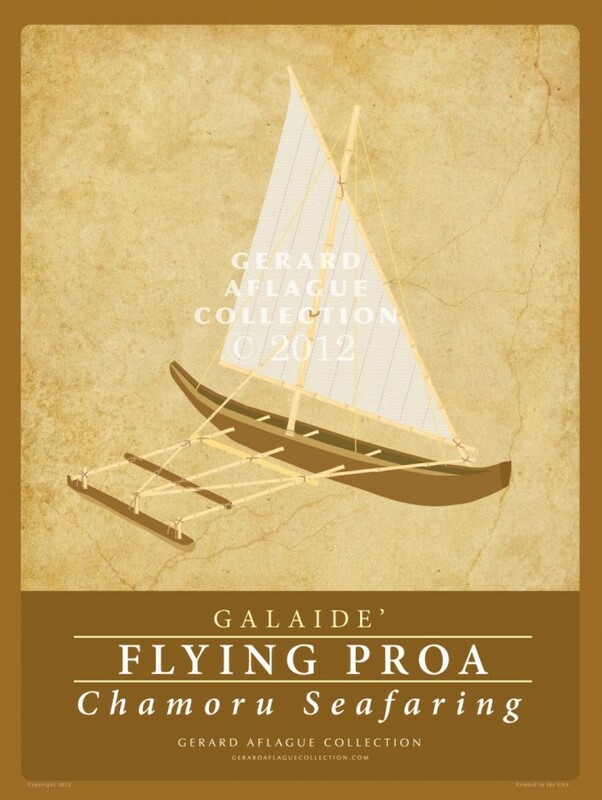 Gerard Aflague Collection (GAC) will take its illustrated products on the road this month. 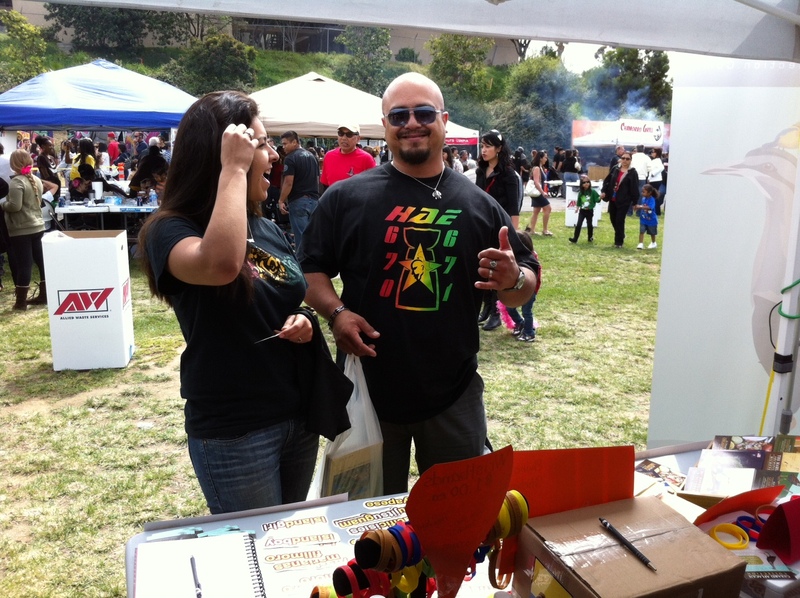 GAC will be one of many vendors at the Chamorro cultural festival in San Diego, California on March 24, 2012. Over 40 unique illustrations will be available for sale at the festival. Our “Chamorro Style – Fiesta Plate” illustration will be our centerpiece. It will be presented as the focal point of our illustrated offerings. This piece will be printed on 4×5 foot banner, with 39 other illustrations displayed life-size along side it. We also plan to incorporate unique marketing strategies, like Facebook giveaways hourly, visitor photo-ops with our life sized Guam Rail, a special raffle to qualified entrants that visit our booth to win five posters of their choice, and customers who purchase will be entered to win a durable plaqued poster that lasts over 150 years. This is the first opportunity that we will be a vendor on-site. It will be interesting to gauge customer interest for our unique culturally-themed products. If we do well, we may decide to attend other Pacific Island related events throughout the country and in the islands. It’s a wonder to realize the feats of the ancient Chamorros as it relates to their engineering acumen and marvel relative to building sea-going vessels. The flying proa, a swift ocean going transport, sailed the Pacific Ocean in ancient times at a rate of 20 miles an hour as one estimate put it. A unique design construction that made this proa different from most vessels made during its time was the nature of the head and stern. You see, most vessels in the world, made their head uniquely different from their stern (or back of the boat). While the proa, had made both ends exactly the same. Where the difference lies in it its sides. One side is relatively flat, while the other side is rounded. Obviously this design by itself, makes the vessel prone to tipping, which is why they engineered an attached hollowed log to the rounded side allowing for a more stable sea-going vessel. The use of bamboo is obvious in the construction of its frame to mount its sail, and as attached appendages to its other far reaching parts. Understanding the value of bamboo requires an understanding of its characteristics. With bamboo’s flexibility, and lightweight characteristic (due to its relatively hollow nature), one could see how a natural material such as this provides an appropriate useful construction material for the building of a proa. Wonderfully designed with a beautiful sail, this provided them an opportunity to use the wind as a source of power for their journeys. It seems that the Chamorros understood the advantage of having a vessel that relied on the trade winds of the Pacific, allowing them to sail up and down the Marianas islands. As a tribute to the Chamorros’ engineering sea-going work of art, we have illustrated their design on an 18×24 inch poster for public display. Visit our website to see and own this beautifully illustrated piece of art. The Palau and Marianas Fruit Dove take center stage as depicted in our most recent illustrations published for the Gerard Aflague Collection. Known scientifically in Palau as Ptilinopus pelewensis, and in the Marianas as Ptilinopus roseicapilla, this bird species shows its beauty through its variety of showy colors. While this bird is endemic in the islands of Palau, it is considered extinct on the island of Guam, with populations dwindling in the Northern Marianas islands due to the accidental introduction of the Brown Tree Snake. The Tottot as it is called in Guam, the Paluman Tottot as it is called in the Northern Marianas, and the Biib as it is known in Palau is more than just a bird in Micronesia. It happens the be the official national bird of the islands of Palau and the Commonwealth of the Northern Mariana Islands. In its short range habitat of Micronesia, this bird lays a single white egg and is cared for by both parents. It has a red forehead, greyish head, back and breast, and yellowish orange belly patch and undertail coverts. Click here to see the illustration of the Palau Fruit Dove in the Gerard Aflague Collection.